Kitschy Summer Fun at Fleetwood Antique Mall! I have been wanting to shake things up out at the mall for a little while and found the time, motivation and assistance this morning. I have taken out many fun new items and if you are a fan of flower power, you will love it! Currently featuring the cafe set at my rock bottom price, you can take a look and take it home right at the mall! Here is a little slide show and I will be adding more items soon. 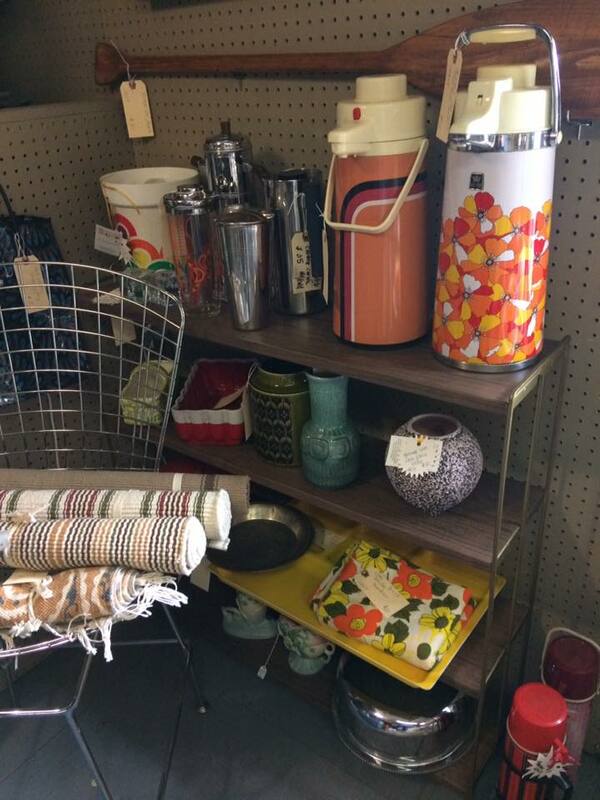 Located on 2nd Floor, Rear of Fleetwood Antique Mall, 14129 Kutztown Rd, Fleetwood, PA 19522. Shop WED-SUN 10am-6pm. I am back in Heywood refinishing mode, thanks to a friend who is working on the sanding for me! I have 2 end tables just like these that are sanded and ready for finish. I will be working on them this week in WHEAT, this set of 3 left with him tonight and I will be making them CHAMPAGNE. Because I am the ADD of projects, I have many things going on now. If you are interested in ANY of them, just reach out and I will focus on that project for you. :) I have ONE ladder back chair left to weave and am hoping to get that done this week as well. Then a big photo shoot! I just picked up a traditional rocking chair today in oak (hand made too) and it needs new cane on the back. Future project but have not done any sheet cane in a little while so figured I'd put that in the queue to get it back to usable. I have a few small projects to do once these big items are behind me and hope to knock them out this summer. I am about 2 weeks out from the spring Mid Atlantic Pyrex Swap in the Baltimore area and I am very excited to participate again this year. I will be focusing on getting things ready to take in the next week. It is always a fun time and promise to share some pics of the great day. This is an annual event and if you are interested in participating in the future, make sure you search for and join the Mid Atlantic Pyrex Collectors group on Facebook. Just know I am super busy right now with spring softball games and practices, spring music concerts and my own band practices and performances. I try to get my items packed and out within 24 hours or less and will continue to try to keep up with that. Deliveries/meets are subject to availability. My weekday availability is Tues, Wed and Fri. Thanks for your support and I hope to assist you soon! Ecclectic estate finds, dining chair options, and a fabulous new restoration begins. I was invited to a local estate to purchase some items that had to go before the sale of the home. I found some interesting items including a fabulous acid cut metal sculpture by an Iranian/American artist called Bijan. Think C. Jere. I read up on the artist and for sure am keeping the piece. I am a sucker for tree art! I also found that the owner had a rug fetish. I picked up a small woven wool wall hanging. I do not intend to sell that at this time. These kind of things I treasure! The real nice Arthur Umanoff metal and Danish cord chairs I recently listed also came from this estate. It has the traditional slat board seat. From what I have found, this particular chair is a harder to find chair. I think it is great on it's own to add some natural interest to a space but also figured folks who have a few might be looking to complete a set. It is in great shape overall. I do think some of the paper cord is off at the ends but I will secure the piece to itself so it stays intact. I would not opt to rewrap as you will lose the fabulous patina and that, in my opinion, makes this chair dreamy! I added new plastic feet caps as there were 2 whites and 2 blacks when I found it. This chair is listed and I could bus ship countrywide. It is not terribly fragile. I also picked a small upholstered arm chair, similar to my orange Heywood Wakefield arm chair, that will need a total redo. Back of the line, but will get to it at some point. This Arthur Umanoff chair looks as good from the back as it does from the front! What else I found in that musty, moldy basement was instant love and I knew I had to take her on..........a fabulous metal frame with hairpin legs MCM daybed/studio couch! I will tell you, after an hour or so of being in that basement, there were definitely moisture issues and I am not sensitive to it myself, but I make all restoration decisions for the benefit of those who are. With that said, this beauty is getting all new cushions. Foam and upholstery. I will not be doing her myself as I felt this was a great opportunity to use my beloved upholsterer in Reading and still be under budget. Although he has not given me a firm price, he said he WILL GIVE ME A GOOD PRICE (in his thick Spanish accent). hahaI already picked the fabric, Bentley Indigo, from Joybird and ordered it the other day. As soon as it shows up, the cushions will be on their way to be used as a pattern. I expect to receive the fabric next week, possibly the week after. This couch should be ready to deliver before Thanksgiving. Please reach out if you would be interested in welcoming her into your home! The fabric I choose is a textured velvet so it will be nice and soft for lounging AND it is from Joybird's PET AND KID FRIENDLY choices! I am super excited to watch this restoration come to life! As much as my mom and I would love to have done the work ourselves, my time is needed elsewhere right now so this just happened to be a great way to support a small local business and still get the work done. Stay tuned for updates as she moves along! This day bed will be totally redone in Bentley Indigo fabric from Joybird. 1968 classic Eames for Herman Miller in fabulous Cobalt upholstery! Just really cleaned up the Eames set and boy am I in love with them! I decided, to keep the price user friendly, I will be selling AS IS, with the stacking bases. Hopefully, the buyer will decide to invest in the repro dowel bases by modernconscience.com. They are $130 each plus $20 shipping, I do not have a special arrangement with them so me buying them for you is just limiting my potential buyers and really, you could add them one at a time as budget allows. There are some really cool things I learned about this set. They are dated 1968. They are MED BLUE fiberglass which was only available to contract customers with a 200+ chair order. I am leaving the IBM sticker on the back of the one chair it is still present on because I think where they came from is freakin awesome! The dawn of the computer age! IBM's nickname was BIG BLUE, so kind of cool they choose these chairs to go with their image. They are in pretty incredible shape. No fiberglass issues and only very minor issues in the vinyl. A few small pin holes, but no big tears or eyesores. Also of note, the foam is SOFT! These are in great working order. I have seen enough trashed shells and have a well trained eye, I can spot the listings with the upholstery issues that no one talks about.....seriously, there is a lot of crap being sold online. I assure you these are just lovely in every way! They are the 'scholastic' or 'wide mount' so the only option of bases is the dowel base in choice of metal and wood. I cannot attest for other repro manufacturers as I would personally buy from the company that Herman Miller refers their customers to for vintage restoration, and that is Modern Conscience. If you choose to add these modern conscience dowel bases, you can choose from walnut or maple wood and chrome or black powder coat metal. Very well made and worth the investment. Another choice of dining chairs I have is the finally complete Broyhill Brasilia chairs. In gorgeous walnut finish and all new foam and upholstery in Pure Water by Joybird, they are stunning. All structural issues have been repairs and a new shellac finish added to protect the wood. These would look great in a more traditional setting if you are not an mcm purist. They have real tall backs and make a formal statement. They are ready to ship or deliver. I can pack these for bus shipping nationwide for $100 or less in most cases. This blue really pops! Mix with greens, blues even yellow and golds! Just added! Red vinyl Viking Artline slipper chair! Priced at $50! Take me home WED-SUN 10-6. 14129 Kutztown Rd, Fleetwood.